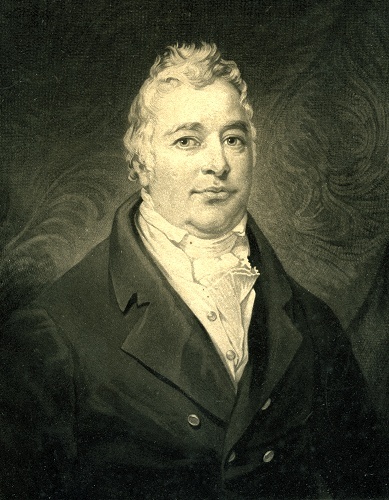 Samuel Oldknow: the first successful maker of British muslins. In the of the middle of the 17th century,100 years before Oldknow was born, cotton was hardly known in Britain, except what came from places like India. In his great book, The History of the Cotton Maufacture in Great Britain, Edward Baines quotes from the travels to India of the merchant, Tavernier, in the middle of the 17th century. "There is made at Seconge a sort of calicut so fine that when a man puts it on, his skin shall appear as plainly through it, as if he was quite naked..…the governor is obliged to send it all to the Great Mogul's seraglio…to make the sultanesses and noblemen's wives shifts for the hot weather ; and the king and the lords take great pleasure to behold them in these shifts, and see them dance with nothing else upon them." We are grateful to Martin Cruikshank of the Marple Local History Society, for permission to reprint here his report of the Meeting. On that evening members of the Society were gathered for their Christmas Party. 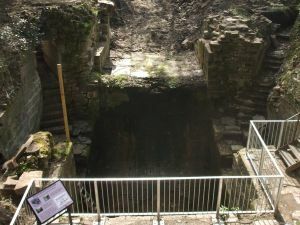 A talk was to be given by Bob on the Wellington Wheel Pit at Mellor Mill, but Bob had suddenly done a disappearing act! From somewhere in the hall came the cry “Who’s been messing with my mill”, eyes darted round the room seeking the source. Then the kitchen door opened, light flooded into the gloom and through it came……The members had come for the Christmas Party that evening. Eight tables were filled with them. All sat patiently, or did they, as others took their turns at the festive feast spread out, brought by all, and shared by all. Decks cleared, they settled back to hear the story of Mellor Mill and the Wellington wheel pit from Bob Humphrey-Taylor. But then whispers began, “Where is Bob”, “He was here five minutes ago”, but now, nowhere to be seen. And who was that coming through that kitchen door? A decade ago key finds from the Shaw Cairn excavations were in danger of being lost forever. The Reverend Marriott, circa 1800, had mentioned in his book, Antiquities of Lyme, barrows near Shaw Farm. In the mid-1970s, four amateur archaeologists with help from school students started ten years of excavations around the trig point on the top of Mellor Moor. They found a Bronze Age burial, which they called Shaw Cairn. Flints, pottery and cremated bones, which were stored in Kilner jars with names such as Hector, Marcus and Fred, were found. The only written record was a diary. In 2000, the material was rescued from one of their garages and a report was written by Victoria Mellor, a student on secondment to GMAU. John Hearle lives in the Old Vicarage in Mellor, a village in Stockport, Greater Manchester. In 1998 three students excavated part of a ditch close to the house. Now after 12 years of excavations with hundreds volunteers, the complex site is being readied for publication. There was a drought in 1995. When Ann Hearle looked over the north wall of the Old Vicarage drive, she saw a green line arcing over the field. On either side the grass was parched. Ann took some photos, thinking that the line might come from the foundations of medieval buildings. How wrong she was! In 1997, Peter Arrowsmith was writing a history of Stockport. Ann showed Peter the photos when he came to ask about the history of the district. He walked round and said "This is old!". That is how it all began. Next year, Graham Eyre-Morgan from the University of Manchester Archaeology Unit (UMAU) brought out three students. They carried out a resistivity survey and then dug trial trenches in the garden. One evening, Graham came out after the students had left and trowelled a bit further. He found the edges of a ditch cut into the rock. As the students dug deeper in the following days, they found Romano-British and Iron Age artefacts.